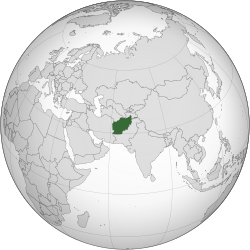 The Islamic Republic o Afghanistan, commonly kent as Afghanistan (/æfˈɡænɨstæn/ ( listen)), is a landlocked an muntainous kintra in sooth-central Asie. It is bordert bi Pakistan in the sooth an east,[note] Iran in the wast, Turkmenistan, Uzbekistan an Tajikistan in the north, an Cheenae in the far northeast. The territories nou comprisin Afghanistan hae been an ancient focal pynt o the Silk Road an human migration. Archaeologists hae foond evidence o human habitation frae as far back as 50,000 BC. Urban civilisation micht hae begun in the aurie as early as 3000 tae 2000 BC. The kintra sits at an important geostrategic location whilk connects the Middle East wi Central Asie an the Indian subcontinent, which haes been hame tae various fowks throu the ages. The land haes witnessed mony military conquests syne antiquity, includin bi Alexander the Great, the Mauryans, Muslim Arabs, Genghis Khan, Mughals an ithers. It haes an aa served as a soorce frae whilk mony dynasties sic as the Greco-Bactrians, Kushans, Hephthalites, Shahis, Samanids, Saffarids, Ghaznavids, Ghurids, Timurids an ithers hae establisht empires o thair awn. ↑ "Article Sixteen of the 2004 Constitution of Afghanistan". 2004. Retrieved 13 June 2012. From among the languages of Pashto, Dari, Uzbeki, Turkmani, Baluchi, Pashai, Nuristani, Pamiri (alsana), Arab and other languages spoken in the country, Pashto and Dari are the official languages of the state. ↑ "Afghanistan". The World Factbook. Central Intelligence Agency (CIA). Retrieved 14 December 2012. ↑ "Chapter 2. The Society and Its Environment" (PDF). Afghanistan Country Study. Illinois Institute of Technology. pp. 105–06. Archived frae the oreeginal (PDF) on 3 November 2001. Retrieved 12 October 2010. ↑ 5.0 5.1 5.2 5.3 "Afghanistan". International Monetary Fund. Retrieved 19 July 2013. ↑ "Human Development Index and its components" (PDF). Retrieved 19 May 2012. ↑ "Afghanistan". Encyclopædia Britannica. Retrieved 2010-03-17. ↑ 9.0 9.1 "The Afghans, Their History and Culture". Center for Applied Linguistics (CAL). June 30, 2002. Retrieved 2010-09-10. ↑ 10.0 10.1 Griffin, Luke (January 14, 2002). "The Pre-Islamic Period". Afghanistan Country Study. Illinois Institute of Technology. Retrieved 2010-10-14. ↑ "Afghanistan country profile". BBC News. 2 October 2010. Retrieved 2010-11-07. ↑ Baxter, Craig (1997). "Chapter 1. Historical Setting". Library of Congress Country Studies on Afghanistan. Retrieved 2010-06-24. ↑ "Kingdoms of South Asia - Afghanistan in Far East Kingdoms: Persia and the East". The History Files. Retrieved 2010-06-24. Wikimedia Commons haes media relatit tae Afghanistan. This page wis last eeditit on 11 Mairch 2018, at 02:08.